OMAHA, Neb. 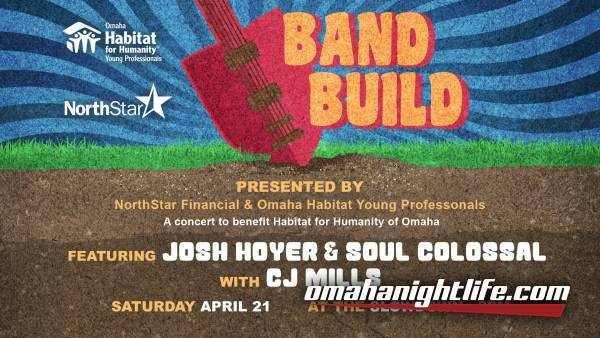 - Omaha Habitat Young Professionals announces their eighth Annual Band Build fundraiser featuring Josh Hoyer & Soul Colossal and CJ Mills. 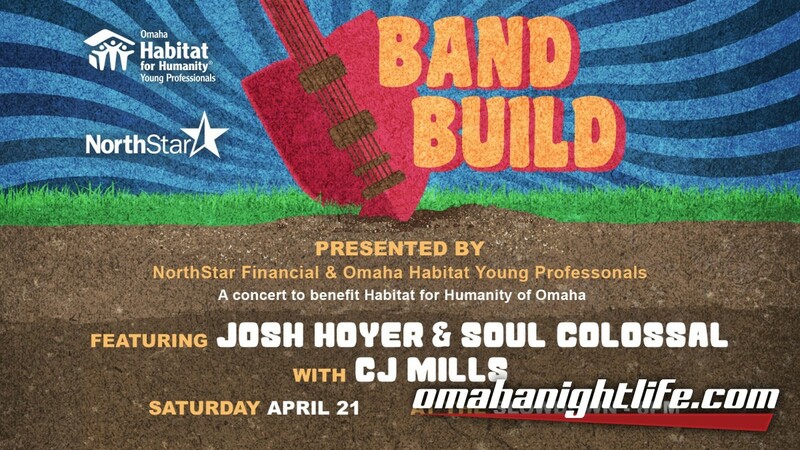 Band Build is a live music showcase benefiting Habitat for Humanity of Omaha. It is organized by Omaha Habitat Young Professionals (Omaha HYP), a group of engaged volunteers who create positive change by promoting homeownership in partnership with Habitat Omaha. Proceeds from the event will go toward eliminating poverty housing in the Omaha community. The eighth annual benefit concert will be held Saturday, April 21, 2018 at The Slowdown, 729 N 14th St, Omaha, NE at 8:00 p.m. Josh Hoyer & Soul Colossal and CJ Mills will perform to help raise money for Habitat Omaha. General Admission tickets are $10 and Habitat Supporter (VIP) tickets are $25. Tickets may be purchased at the door, online, or from Omaha HYP members. Through this event, Omaha HYP plans to raise $20,000 in support of the Habitat Omaha home they are helping build and sponsor in 2018. Thanks to the support of NorthStar Financial Services, Lovely Skin, AECOM, DMSi, CE Smith Custom Cabinets, First Management Inc., Vintage Financial, CSGi, and Sentinel Property group, this year's Band Build is already off to a successful start. For more information, visit Omaha HYP at facebook.com/HabitatOmahaYP. Founded in 1984, Habitat for Humanity of Omaha is a grassroots organization that builds and renovates houses, forges community partnerships and breaks down barriers. We eliminate vacant lots and abandoned homes in the blighted areas of North and South Omaha while improving the overall appearance of our community. When families partner with Habitat Omaha they are required to complete up to 350 hours of Sweat Equity before purchasing their homes through 25-to-30-year affordable mortgages. Since 1984, Habitat Omaha has partnered with more than 1,170 families in our community; this year we will impact the lives of more than 150 families in the Omaha area. In 2018, Habitat Omaha will build or renovate up to 50 homes, demolish 20 blighted structures, and provide critical exterior repairs for 60 homeowners. For more information, visit habitatomaha.org.